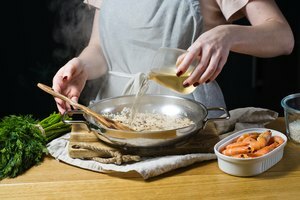 Vinegar has been around and used in cooking for more than 5,000 years, s0 it makes sense that the ingredient remains in many recipes we still cook today. Vinegar is made by adding bacteria to other fermenting ingredients to create acetic acid. Vinegars of all types are used in making marinades, dressings, sauces, pickles and even some baked goods. 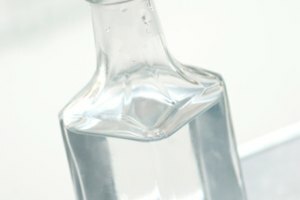 One of the most common types, white vinegar, is distilled vinegar. Known as one of the stronger types, white vinegar is 5 to 7 percent acetic acid. With a basic knowledge of vinegar, finding a substitute to round out a recipe can be a simple fix. Lemon or lime juice are the two most common substitutes for distilled white vinegar. Other replacements include apple cider vinegar or malt vinegar. The one-to-one ratio for these substitutes and the easy availability of these alternative pantry items make the swap a breeze. For every tablespoon of white vinegar a recipe calls for, simply swap one tablespoon of any of these white vinegar substitutes. 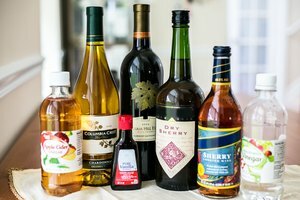 Other vinegars, such as apple cider or malt vinegars, work better for marinades and sauce recipes. Lemon and lime juices are better substitutes for distilled white vinegar when the ingredient is called for in baked goods or salad dressings. 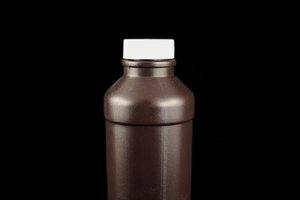 If in search of other types of vinegar replacements, white vinegar can be combined with other ingredients to be swapped without much trouble. 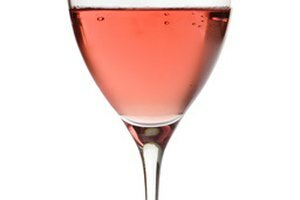 Equal parts white vinegar and red wine can be mixed to replace red wine vinegar. One and one-half teaspoons of each will replace one tablespoon of red wine vinegar. For a rice vinegar replacement, combine distilled white vinegar with a little bit of sugar. One tablespoon of rice vinegar should be exchanged for one and one-half teaspoons of white vinegar and one-quarter teaspoon of sugar, mixed well to dissolve the sugar. The substitute for apple cider vinegar is the equivalent of a distilled white vinegar substitute, lemon or lime juice. Once again, this is a one-to-one ratio, so use an equal amount of lemon or lime juice for the apple cider vinegar the recipe calls for. Sherry vinegar is also an easy swap with plain red wine as the replacement. Use the same amount of red wine for the sherry vinegar the recipe calls for. Specialty vinegars, such as herb vinegar or raspberry vinegar, can also be mimicked at home if these are unavailable. For herb vinegar, use one tablespoon of red wine vinegar, rice vinegar or apple cider vinegar and add enough of the herb you prefer – perhaps rosemary or thyme – to balance the mixture. Choose the replacement vinegar based on the dish, salad dressing or sauce that you're preparing. The substitute should be strong enough to stand up to the recipe without overpowering it. One tablespoon of sherry vinegar is an ideal substitute for raspberry vinegar. If you're preparing a food for long-term storage, be aware of the type of vinegar the recipe calls for and the acidity of the vinegar. For example, if a pickle recipe calls for white vinegar, which is 5 to 7 percent acetic acid, another vinegar or solution can be substituted, but it should have the same level of acetic acid. Maintaining proper acid levels will ensure that the chemical reactions you want to happen will fully occur. If not, the food may not last as long in storage or be safe to eat after being kept for an extended period of time. When in doubt, play it safe and make a trip to the grocery store to stick with white vinegar.